In the early 19th century, a canal had been proposed to connect the Peak Forest Canal, which terminated at Whaley Bridge, with the Cromford Canal, providing a direct route between markets in Lancashire and Derbyshire. However, costs were prohibitive and the plan was abandoned. Josias Jessop, the son of William Jessop, believed that a wagon way would be much cheaper than a canal. On 2 May 1825 an Act of Parliament for the construction of a railway from Cromford to Whaley Bridge was passed. The proposal – backed by William Cavendish, 6th Duke of Devonshire, Richard Arkwright junior, and several Manchester bankers – was ambitious; it was expected that steam locomotives would be used on the line, even though the technology was in its infancy and George Stephenson did not build his revolutionary Rocket until 1829. The main purpose of the railway was for the transportation of minerals, such as limestone, lime, coal and iron, as well as general goods. This extraordinary standard gauge (4 feet 8½ inches) railway was provided with edge rails from the outset and it was opened in two sections. The first was from Cromford Wharf (later extended to join the Midland Railway at High Peak Junction) to Hurdlow, a distance of 15½ miles, which opened on the 29 May 1830 and the second was from Hurdlow to Whaley Bridge, a distance of 17½ miles, which opened on the 6 July 1831. Its summit level was more than 1,200 feet above sea level. The first steam locomotive on the line was introduced in 1841; before that, the traffic had been made up entirely of wagons. The railway ascended from 277 ft above sea level at Cromford Wharf to a height of 1,264 ft above sea level at Ladmanlow, before descending to 747 ft (228 m) at the wharves of the Peak Forest Canal. The changes in height, which would have necessitated many locks for a canal, was relatively easy for a railway. However, for a time the Comford and High Peak Railway did have the sharpest curve out of all railways in Britain and the steepest incline for vehicles without steam power. Having been built to connect the Peak Forest and Cromford Canals, the railways fortunes were closely tied with those of the canals. The line was not profitable as by the time it had opened traffic had declined along the Cromford Canal. In 1855, an Act of Parliament allowed the line to transport passengers as well as freight. Although passenger travel became more important to the railway, it went into decline and closed on 21 April 1967. Sheep Pasture, incorporating the Cromford inclined plane. Stationery engine. Gradient 1 in 8.5, 1,320 yards long. Hopton. Stationary engine and from 16 April 1877, locomotives. Gradient 1 in 14, 220 yards long. Hurdlow. Stationary engine. Gradient 1 in 16, 850 yards long. This incline was abandoned on the 2 January 1869 when the Hurdlow Deviation replaced it. Bunsall Upper. Stationary engine. Gradient 1 in 7.5, 660 yards long. Bunsall Lower. Stationary engine. Gradient 1 in 7, 455 yards long. Note: The Upper and Lower Bunsall incline planes were combined on the 8 June 1857. Mean gradient 1 in 7.5, 1,100 yards long. Shallcross. Stationary engine. Gradient 1 in 10.25, 817 yards long. Whaley Bridge. Horse gin; also known as a horse capstan or horse whim. Gradient 1 in 13.5, 180 yards long. In use, a horse was harnessed to the outer end of a long pole that was attached to the top of a vertical shaft that arose from a wheel pit, covered with boards, at the top of the plane. A pinion was fastened to the bottom end of this shaft, which meshed with a larger gear wheel. A pulley was fastened to the same shaft as the larger gear wheel and the endless chain from the plane was passed around this. There was another covered wheel pit at the bottom of the plane and the endless chain also passed around this, so that the chain crossed from one rail track to the other. Wirksworth Branch. This inclined plane is interesting because three rails formed two tracks, the centre rail being common. A passing loop was provided so that waggons traversing the plane could pass each other. It should be noted that, depending upon which company record is referred to, then the gradients do vary slightly from the values given above and over the years some of the gradients were modified, particularly that of the Hopton inclined plane when it was found that locomotives could climb it. It is known that the Butterley Company built the stationary engine at Middleton Top and in view of this it is probable that this company built all the stationary engines used on this railway. Between 1792 and 1806, this company traded as Benjamin Outram & Company. The source of power for the Wirksworth Branch inclined plane is rather enigmatic. The 'engine house' consisted of a large stone-built plinth surmounted by a concrete floor, on top of which stood a complex framework of heavy-duty timber. In this respect, it more resembled a horse gin than it did an engine house. The Cromford and High Peak Railway is celebrated for its many curves and on the summit, between Longcliffe Goods and Friden, there were 21 curves of 110 yards radius or less, three of these being 66 yards, while one, the record holding Gotham Curve, had a radius of only 55 yards, the line turning through 80°. *Hindlow tunnel was a later addition and was double track. It was bored for the London and North Western Railway's, Whaley Bridge - Buxton - Parsley Hay line. When the railway first opened, wagons were hauled by horses along the more level sections and afterwards by steam locomotives. To begin with, it took about two days to traverse its full length. Steam locomotives were first introduced in 1833 but it is understood that these were complemented by horse haulage for about another 30 years. Following the introduction of steam locomotives, it was discovered in 1877 that they could tenaciously climb the Hopton inclined plane, which had a gradient of 1 in 14. An official passenger service was operated on the Cromford and High Peak Railway between 1874 and 1877 and during this period there was one train daily throughout the length of the line, in each direction. This service ceased in 1877 following a passenger being involved in a fatal accident. Nevertheless, this was not the first passenger service on the railway. It seems that Messrs G Wheatcroft operated the first service under contract and this commenced in May 1833. For the convenience of passengers travelling on the railway, this firm also ran a coach service between Whaley Bridge and Manchester. It is not known when these railway and coach services ceased running. A Trade Directory of 1835 shows that this firm was also a 'Conveyancer by Water'. German Wheatcroft and his sons managed this firm and German was the first Wharfinger (Manager) at Bugsworth Wharf on the Peak Forest Canal when it opened for trade in 1796. Little is known about German but he disappeared from Bugsworth in 1805 to reappear again in 1833 as the operator of a passenger service on the newly opened railway. In circa 1808, a Jerman Wheatcroft was in charge of the inclined plane on the Peak Forest Tramway at Chapel-en-le-Frith. It is possible that Jerman was another member of the same family, rather than it being a difference of spelling. It is likely that German was born at Crich, Derbyshire, and that he was Christened there on the 9 May 1773, his father being Abraham Wheatcroft. He died at Belper, Derbyshire, either in 1841 or 1849. The railway remained an isolated line until the 21 February 1853 when the Manchester, Buxton, Matlock and Midlands Junction Railway made a connection to it. It was leased to the London and North Western Railway in 1862 and it was fully taken over by them in 1887. Following authorisation to connect the railway directly to Buxton by the construction of a line from Harpur Hill, much of the original northern end of the railway had been abandoned by 1890. This being between Parsley Hay and Harpur Hill and between Bunsall tunnel and Shallcross Yard, above Whaley Bridge, by way of the Goyt Valley. Much of the abandoned track bed is still extant and the two Bunsall inclined planes now form part of a road. The short section from Shallcross Yard to Whaley Bridge, including the inclined plane, remained open until the 9 April 1952. By the time of the 'Beeching Era', trade from local limestone quarries was decreasing and another section of line closed in 1963, this being the Middleton inclined plane. The section between Middleton and Parsley Hay closed on the 30 April 1967 and this included the Sheep Pasture and Hopton inclined planes, the latter, with its gradient of 1 in 14, being the steepest adhesion stretch of railway line in Britain. The final section, between Friden and Parsley Hay, closed in September 1967. 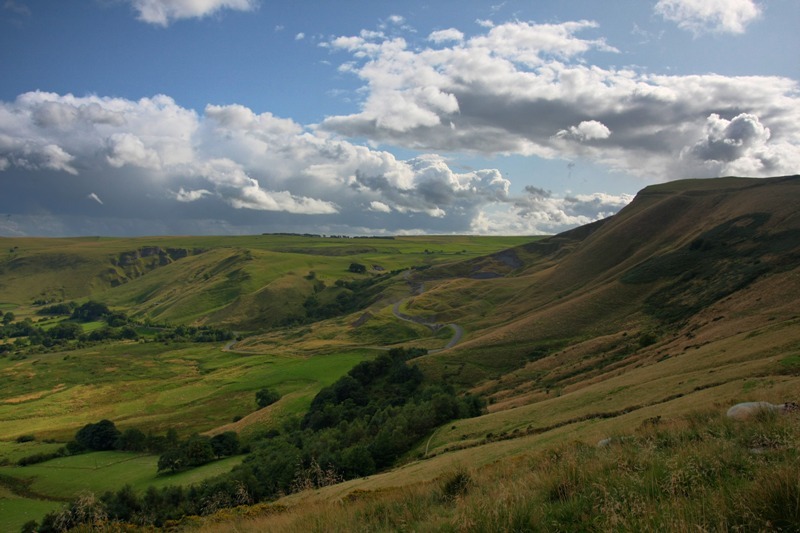 In 1971, the Planning Board of the Peak District National Park, in collaboration with Derbyshire County Council, bought much of the track bed and used it to create the High Peak Trail. This is now a national route of the National Cycle Network as well as being popular with walkers and horse riders. Part of the trail is also designated as a section of the Pennine Bridleway. The engine house of the Middleton inclined plane at Middleton Top was preserved as a Visitor Centre and the beam engines, once used to haul waggons, are occasionally demonstrated with compressed air. Near Cromford, the railway passed below Black Rocks and this is a popular locality for climbing. An additional attraction for visitors to the area is the Steeple Grange Light Railway, which is a narrow gauge railway that runs along the track bed of a former branch line of the Cromford and High Peak Railway near Wirksworth. This 18 inch-gauge railway was built in 1985 on part of the former Killer's Branch to Middleton Quarry from Steeple House Junction on the Cromford and High Peak Railway. This line features a 1 in 27 gradient and there are two operational passenger locomotives as well as two works locomotives and others are under restoration. Two extensions to this line are being studied, one is to the National Stone Centre and the other is an extension up the gradient towards Middleton Quarry. The later (1899) railway line between Ashbourne and Buxton joined the Cromford and High Peak Railway at Parsley Hey and this now forms part of the National Cycle Network and it is known as the Tissington Trail. The heyday of this line was in the 1930s when it was extensively used by ramblers because of its proximity to Dovedale. For a time, there was also a through service between London (Euston) and Buxton via Nuneaton, Uttoxeter and Ashbourne but this was discontinued in the early 1950s. At Whaley Bridge, it is possible to explore the short inclined plane that brought goods down the hillside and across an iron bridge over the river Goyt to the transhipment shed and wharf at the terminus of the Whaley Bridge Branch of the Peak Forest Canal. It is also possible to see the site of the horse gin that was used to operate the inclined plane. From Whaley Bridge, it is a one-mile walk along the towpath of the Peak Forest Canal to visit the Ancient Monument of Bugsworth Basin at the terminus of the main line of the canal. This was the interchange between the Peak Forest Tramway and the Peak Forest Canal and nowadays it is possible to explore part of the tramway by walking along the Tramway Trail.